As the summer sun continues to beat down on the British Isles, ghosts are appearing in the yellowing fields. Normally kept hidden by lush grasses and crops, old and prehistoric features are making themselves known through imprints on fields and lawns, some for the first time in known memory. It's hard to see these features from the ground - but with the rise of drones for aerial photography, they can be captured where they may have remained unidentified in previous heatwaves. The marks are revealed when grass or crops on top of wood or stone still in the ground flourish or deteriorate at different rates to surrounding material in the unusually hot weather. In County Meath, Ireland, one aerial photographer made a discovery that turned out to be far more significant than he initially realised. 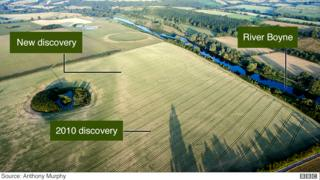 Anthony Murphy, 44, captured pictures of a henge, using his drone in Newgrange. And when he noticed the "amazing detail", he "giggled with excitement, expecting someone to pinch and wake me up". The henge, in a field close to other late Neolithic monuments, is "entirely new" and includes "extraordinary and unexpected" features, according to Stephen Davis, assistant professor in archaeology at University College Dublin. This revelation, by the river Boyne, brings the total number of monuments in a 1.5km (one-mile) stretch to an estimated seven, according to Mr Davis. "The area in front of Newgrange is, I believe, now the densest concentration of these monuments anywhere in the world," he said. 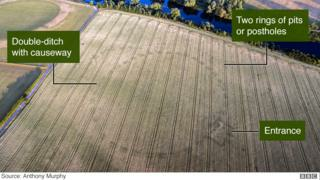 Ditches created by the henge retain more moisture than surrounding soil, enabling crops above to grow more healthily. There are no plans to dig on the site, which is a working farm. And once the crop is harvested, the image will disappear. Meanwhile, in Clumber Park, in Nottinghamshire, a large estate owned by the National Trust, a spectacular ghost of a building is emerging. 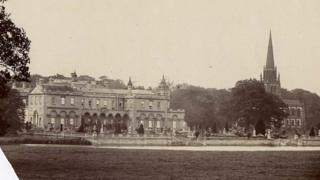 The building that once stood on these imprints is Clumber House - a grand 18th-Century mansion demolished in 1938 after a series of fires and economic downturn. 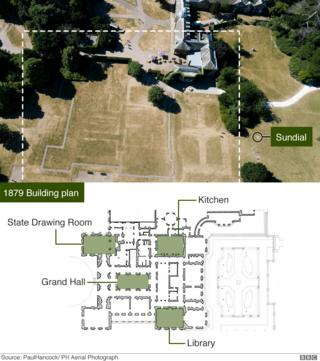 Rooms and corridors became visible as stone foundations left in the ground heated up more quickly than surrounding material, scorching the soil above to a lighter shade, according to Ben Mason at the National Trust. 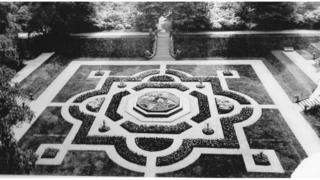 Although the mansion itself is not a new discovery, a previously unknown sundial in front of the lawn has been identified. "Even our longest-serving staff, who have been here since the 1970s, can't remember seeing this much detail. It's very unusual," Mr Mason said. Next month, archaeologists will dig at the site to determine whether cellars not demolished in 1938 are still accessible. 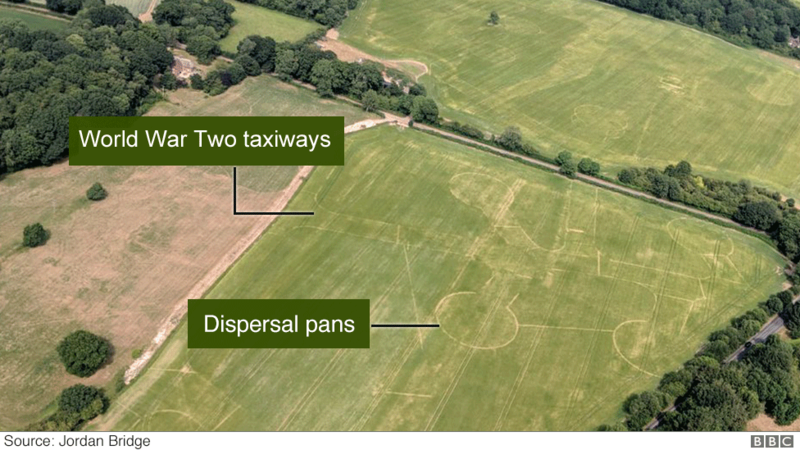 At the end of June, markings appeared in farmland close to an airfield at Lasham, Hampshire, a reminder of the area's war-time history. Lasham Airfield was an RAF station during World War Two and is still in use as an active airfield, although a small part of it returned to farmland after the war. Jordan Bridge, who works at the Lasham Gliding Club, captured images of the almost forgotten runways. "In seven years' flying, I've never seen these appear before," the 20-year-old said. 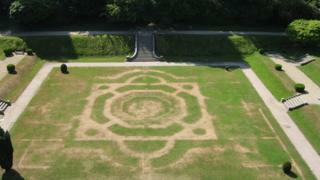 Knowing the history of the site, he waited over a week to take the perfect shots of the crop circles. "What I really wanted was the detail of the taxiways and aircraft dispersal patterns from the 1940s that I've seen in old photos of the airfield," he said. In Gawthorpe Hall, Lancashire, the dry weather has brought back a Victorian garden, even if it is now a mere shadow of its former self. Museum manager Rachel Pollitt said that while it appeared most summers, this year it was "quite spectacular" and that parts of previous gardens had possibly also been revealed.